There are plenty of ways to save during a vacation, especially with hotels, but if you’re willing to think outside the box, you can possibly save more. Instead of shelling out a bunch of money for an overpriced hotel room, how about not staying at a hotel at all? There are alternatives to staying at the traditional hotel that are much cheaper and sometimes even free. These different accommodations allow for an exciting, off-the-beaten path adventure, but a few can also pose some safety concerns. Here are nine alternative to hotels that can save you money. Hostels. Today’s hostels are very versatile, but in general, it’s a dormitory like accommodation where you’re sharing a room or bathroom with several other guests. Depending on location, beds can start as little as a few dollars per night. I usually associated hostels with Europe, but to my surprise, there are plenty in the United States and all over the world. Some hostels come equipped with a kitchen or community areas. Check out sites like Hostelworld.com and Hostels.com to find hostels wherever you’re traveling. To make the best choice, read reviews and ratings. There are obvious safety concerns with sharing a room with a stranger so if you’re interested in hostels, research which ones are safest, don’t travel with valuables, and don’t travel alone. Farmstay. If you’re looking for a rural, farming experience, try a Farmstay. This concept is common in Europe and Australia but a newer concept in America. Sites like Farmstayus.com list ranches, farms, and vineyards that offer accommodations for guests. Sleeping conditions and what’s offered at each place is very versatile. Some farmstays come with classes like how to make cheese, meals, and can be just as expensive as a hotel. However, you can find places for as low as $25. Camping. 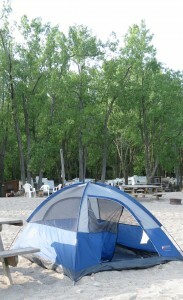 If you already have camping supplies or can get a good deal on them, camping is an affordable option for lodging. Camp grounds, on average, cost about $20 per night. Like I mentioned in my camping guide, you can find both private and public campgrounds with a variety of amenities. There can be a beach, pool, game room, playground equipment, fishing, hiking, bird watching, and dozens of other activities to provide you and your family with free entertainment. You can also find campgrounds with free wireless internet, laundry facilities, and grills and fire pits right next to your camp site. Condo, cabin or RV. If you’re traveling with your entire family or a larger group of people, it may make more sense to rent a condo, cabin, or RV to save costs. All three will have one major thing that a hotel won’t to save you money: a kitchen. If it’s a road trip, you can bring food with you from home or at least buy food for much less at a nearby grocery store. Cooking your meals will save a ton of money. Even being able to have cold drinks on hand will save you money. You’ll also have more room to relax so less of an urgency to run out of the hotel room to spend money. Apartment. If you’re traveling for an extended amount of time, look into renting an apartment instead. The cost of staying at a hotel for three weeks would be astronomical. So instead, see how much local apartments are going for and see if you can get a short-term lease. You’ll have the same advantages of the condo or cabin such as a kitchen and laundry facilities. When my best friend was traveling through Europe, she rented an apartment in Italy. From there, she was able to make weekend trips to other countries with affordable plane tickets and riding the train. House swapping. For the trusting traveler, there’s the option to house swap, which is trading your home, condo, apartment, yacht, RV, or villa for someone else’s house somewhere else. Sites like HomeExchange.com list people willing to trade all over the world for different amounts of time. You pay absolutely nothing for this, but there are security risks with letting people stay in your home. People that participate in this activity enjoy getting a more genuine feel of the location and in many cases, having access to the person’s car as well. Hospitality exchange. Also found on HomeExchange.com, there is the option to host each other at designated times. The difference between house swapping and hospitality exchange is the owner of the home is there while you are in their house. In turn, you allow them to stay at your house at a different time while you are home. The benefits of this is hearing their recommendations and getting to know the local people from the area you’re visiting. Just like home exchange, this is free. Again, you must be extremely cautious while staying in a stranger’s home or letting them stay in yours. Couch surfing. Similar to hospitality exchange, couch surfing is staying at a stranger’s home for free. Unlike hospitality exchange, you do not need to repay them by letting them stay at your house. Couchsurfing.org allows you to search for people willing to let you stay with them by location. Many people simply want to give fellow travelers the same kind gesture someone once gave them. Couch surfing, like hostels, home exchange, and hospitality exchange, is an experience that requires caution and has safety concerns. Stay with friends or family. If you’re like me and want to play it safe, stay with your friends, family, and acquaintances. With so much interaction on facebook and other social media sites, you can even stay with old friends who have moved away. You can offer to have your hosts stay with you at a different time to make it more comfortable. To repay them for the roof over your head, offer to help with cleaning, cooking, and other household chores. Besides getting a free place to stay, you’re also spending time with people you care about and getting great advice about what you must see. Which hotel alternatives have you tried on vacation? I have to comment on the couchsurfing. I have been hosting for over a year now and have hosted over 2 dozen different people. My kids and I have absolutely loved the experience and I highly recommend doing this for other families. You do have to have rules about who you host but there are rules for everything in life! Um, many of these are fraught with probable problems, especially given the times we live in. Take it from me, Joe Privacy, hostel, house swap, couch surf – you’re asking for trouble! The RV option is probably the safest. I’ve tried out couchsurfing.org for the first time this past summer, and it was a great experience! An aspect of it that I would emphasize is that it allows you to meet locals and gain experiences you wouldn’t get if you stayed at a hotel or hostel. I have also heard about airbnb.com, which is a vacation rental site that where you can find apartments to rent for less than what you’d pay at a hotel. Thank you for the mention of Farm Stay U.S.! We love that there are so many options when choosing a farm, ranch, or vineyard stay — you might find anything from camping in your own tent by a creek, to modest cabins, to luxurious B&B style rooms. No matter what you choose, getting to know your hosts is a definite perk!